The blink of an eye. That’s how fast a mission can fail if vision is compromised. But there is more to goggles than protection. Comfort is essential for eliminating distraction. The field of view must be wide and unobstructed, and the visual clarity must be razor sharp and true. A standard issue goggle that sets the standard, the Oakley SI BALLISTIC GOGGLE 2.0 takes a lean-and-mean approach that maximizes comfort and offers a field of view that earns the rank of best in class. The low profile design weighs a mere 3.7 ounces, yet its impact resistance complies with ANSI Z87.1-2003, EN-166 BT K and U.S. Army MCEPS, plus MIL-DTL-43511 ballistic impact resistance requirements in all lens configurations. All lenses feature the unrivaled clarity of High Definition Optics® (HDO®), and Polaric Ellipsoid™ geometry maintains visual fidelity all the way to the lens periphery. That means objects appear in their true position, not shifted like the view from ordinary goggles. It all comes in an interchangeable lens design that holds the lens securely in place yet allows for quick and easy lens changing in the field, thanks to a convenient locking slide. Engineered for minimized facial standoff, the frame is matched with a low-profile, flame-resistant strap system designed for quick release and enhanced with anti-slip tack strips. Moisture wicking fleece foam maintains comfort along the facial contact area. 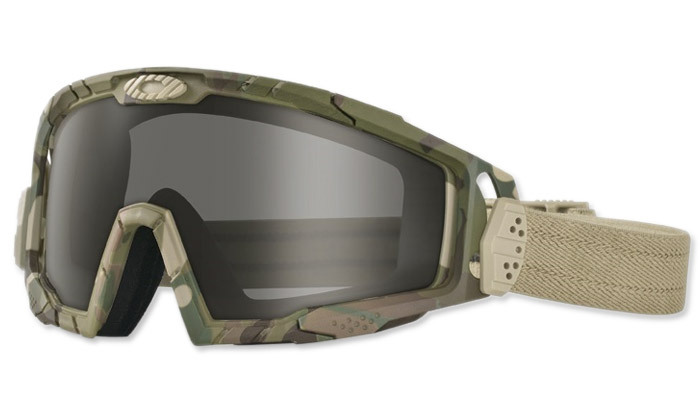 The compatibility of this goggle is wide-ranging, and it can be used with MICH, ACH, LWH, CVC, FAST, Crye™ and Ops-Core® helmet systems, as well as helmet-mounted night vision devices.